Original Editors - Stacy Downs as part of the Bellarmine University's Pathophysiology of Complex Patient Problems project. Psoriatic arthritis is a chronic progressive inflammatory joint disease that can be associated with psoriasis. The condition may affect both peripheral joints and the axial skeleton causing pain, stiffness, swelling, and possible joint destruction. This joint pathology progresses slowly and can be more of a nuisance than disabling. Psoriatic arthritis is considered a seronegative spondyloarthropathy. The fact that it is "seronegative" means that the blood tests negative for a certain factor that is present in rheumatoid arthritis. Spondyloarthropathy is a word that describes a group of conditions that all share two common characteristics. First, there is the presence of arthritis that affects the spine or extremities with evidence of family inheritance. Secondly, inflammation occurs in the ligaments, tendons, and occasionally in organs such as the eye. Psoriatic arthritis causes inflammation, pain, stiffness, and swelling in joints as well as ligaments and tendons at their insertion sites. 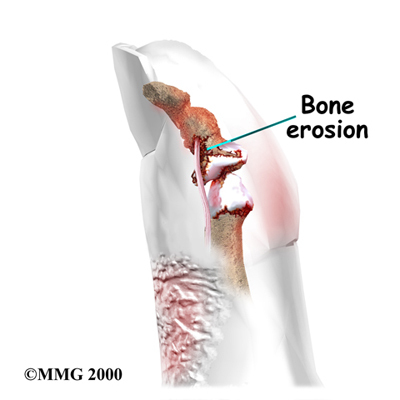 Bone, tendons, enthesis, cartilage, synovial membrane, skin, and nails may all be affected by the condition. During the initial stages it is the tendons, synovia, and articular capsule that are primarily affected. As the condition progresses, tendon and bone becomes altered. Marked joint destruction may occur in some individuals. Psoriatic arthritis is a condition that may often be misdiagnosed due to the wide variety of clinical presentations. Even though it is associated with psoriasis, in 15% of cases the arthritis appears first. In cases where psoriasis appears first, it usually occurs 8-10 years before. Mild cases of psoriasis may be incorrectly diagnosed as exzema, seborrheic dermatitis, or atopic dermatitis. This may further complicate diagnostic accuracy. Expression of the disease varies greatly from one person to the next. Its course is unpredictable, ranging from mild to severe and destructive. In around 70% of cases, psoriasis precedes arthritis. For the majority, joint symptoms do not appear until approximately ten years after the first signs of psoriasis. Both occur simultaneously in 15% of cases. Extra articular manifestations of psoriatic arthritis include inflammatory eye disease, such as vitis and iritis, renal disease, mitral valve prolapse, and aortic regurgitation. The urethra may also become inflamed and fatigue can be a significant problem for people with psoriatic arthritis. Distal Interphalangeal Dominant - Only DIPs of fingers or toes are affected with nail changes often present. Symmetric Arthritis - This type resembles rheumatoid arthritis. Five or more joints will be affected in a symmetrical pattern throughout the body. Asymmetric Arthritis - This is the most common type making up 70% of cases. Four or less joints are affected in an asymmetrical pattern. Spondylitis - This type causes inflammation in the spine. The neck, low back, and SI joints are often affected. It may coincide with symptoms throughout the extremities. Arthritis Mutilans - This type is the most severe and destructive. Mutilation of the small joints of fingers and toes often occurs. The fingers may appear sausage like due to swelling. This is the most rare form, occuring in less than 1% of all cases. Diagnosis of psoriatic arthrits may often be delayed since there are no identified biomarkers at this time. If left untreated psoriatic arthritis may lead to severe physical limitations and disability. Early diagnosis is critical to slow the progression of the disease with medications. 1. Skin lesions: These include well-defined, dry, red, and usually over-lapping papules and plaques that characterize psoriasis. The patches are usually not itchy and are found most commonly on the extensor surfaces of elbows, knees, back, and buttocks. 2. Nail lesions: Include pitting, ridging, brown/yellow discoloration, cracking, seperation or loosening of the nails (onycholysis). Presentation of nail impairments may be mistaken for fungal infection, and may be the only clinical feature in patients whom are more likely to develop arthritis. 3.Arthritis: May appear early on and as a sever sign in half of all patients with psoriatic arthritis. Wrists, ankles, knees, and elbows are likely to be involved. Client may report morning stiffness lasting for more than 30 minutes, tenderness, and inflammation. 4. Soft-tissue involvement: May include tenderness at the site of tendon insertion or muscle attachment. Commonly seen in the Achilles, plantar fascitiis, and flexor tendons in the hand. 5. 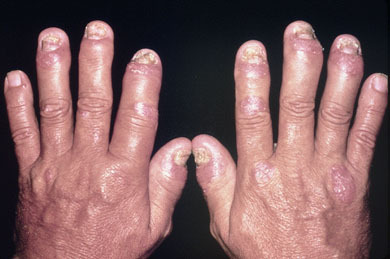 Dactylitis: Occurs in one third of the psoriatic arthritis population that presents as swelling of the whole the finger making them appear "sausage-like". Goals of treatment: Reduce pain, stiffness and swelling, inhibit disease progression, optimize function, decrease effects of the disease, and improve the patients quality of life. Otezla is a new drug that has been approved in 2014 for psoriatic arthritis. This drug is an oral phosphodieasterase-4 (PDE-4) inhibitor that will decreases proinflammatory mediators and increases anti-inflammatory mediators. There is no definitive test. Diagnosis is made by ruling out other conditions. X-rays are the current gold standard. However, signs of psoriatic arthritis often do not appear on radiographs until later stages of the disease when bone erosion has occured. Contrast enhanced ultra sound is starting to play a leading role since it can detect changes in bone and soft tissue much sooner than X-rays. DIP erosive changes on X-rays may support the diagnosis. Blood work will be done to detect for the HLA-B27 since it is a common histocompatibility complex marker in people with psoriatic arthritis. A blood test for rheumatoid factor should be done to rule out rheumatoid arthritis. A blood test for antinuclear antibody (ANA) should be done to rule out Lupus. CBC should be done to check for a reduction in red blood cells that sometimes occurs in psoriatic arthritis. A joint aspiration may be done in which a syringe removes fluid from a joint. The fluid is then examined for the presence of infection, crystals, and white blood cells. Trauma and infection may trigger the developement of psoriatic arthritis. The immune system is believed to play a key role in the development of psoriatic arthritis. Cytokines have been found to be in high abundance in the joints of people with psoriatic arthritis. Cytokines are inflammatory messengers that are released when T cells are activated. Tumor necrosis factor is a specific cytokine that is abundant in the skin, blood, and joints of patients with psoriatic arthritis and psoriasis. The job of tumor necrosis factor is to regulate inflammation in the body, and it should be present in low levels. Continued high levels of tumor necrosis factor leads to inflammation in the body. Blocking this particular cytokine often leads to significant improvement in psoriatic arthritis. It is ideal for patients to have coordinated care between a dermatologist and rheumatologist since the majority have both skin and joint manifestations of the disease. Since disease manifestations first begin within the skin and nails, it is likely the patients first point of contact is a dermatologist, putting them in an optimal position to be the first to screen for PsA. There are several screening questionnaire available for PsA including the TOPAS, PEST, PASE, and the EARP, all of which are filled out by the patient. Some of which have been tested to show good sensitivity and specificity. This patient should be referred to a rheumatologist immediately if undiagnosed psoriatic arthritis is suspected. All patients with manifestation of arthritic type conditions should be asked if they have any type of skin condition or patches of dry skin. They should also be encouraged to see a rheumatologist that can verify the type of arthritis that they have. Physical therapy can play an important role in improving the life of a person with psoriatic arthritis. Physical therapy management should focus on education, improvement of range of motion, strengthening, and general cardiovasuclar conditioning. Physical therapists may also provide UV therapy and modalities to decrease pain. Cryotherapy may help to reduce swelling and tenderness in affected joints. Heat may be used to relieve joint pain. Paraffin baths tend to be soothing for the hands and feet. Splinting may be of benefit to prevent deformity. Recently studies have shown that hydrotherapy is also an effective treatment for patients with psoriatic arthritis. Hydrotherapy has been shown to improve physical function, energy, sleep and relaxation, cognitive function, work, and participation in patients with psoriatic arthritis. Stiff joints and muscle weakness can occur in patients with psoriatic arthritis due to lack of use. Exercise can be an important intervention that patients can use to prevent or reduce these impairments from occurring. Examples of exercise that can be done include walking (a walking aid or shoe inserts may be needed to decrease the stresses on the affected joint), bikes, yoga, and stretching (for relaxation). Water therapy may also be beneficial, such as swimming or walking laps, in order to decrease the stress on the joints. ↑ 1.0 1.1 1.2 1.3 Goodman C, Fuller K., Soft Tissue, Joint, and Bone Disorders. In: Hart CM, Waltner P, editors. Pathology Implications for the Physical Therapist. St. Louis: Saunders, 2009. P1288-89. ↑ 2.0 2.1 2.2 2.3 2.4 2.5 2.6 2.7 2.8 Langley R. Psoriasis: Everything You Need to Know. New York: Firefly Books; 2005. ↑ 3.0 3.1 Fuller KS. Pathology: Implications for the Physical Therapist. Third Edition. St.Louis: Saunders Elsevier; 2009. ↑ 5.0 5.1 American College of Rheumatology. Diseases and Conditions: psoriatic arthritis. http://www.rheumatology.org/Practice/Clinical/Patients/Diseases_And_Conditions/Psoriatic_Arthritis/(accessed 24 Mar 2014). ↑ 6.0 6.1 6.2 6.3 Waldron N. Care and support of patients with psoriatic arthritis. Nursing Standard 2012;26:35-39. http://rcnpublishing.com/doi/abs/10.7748/ns2012.08.26.52.35.c9247(accessed 20 MAr 2014). ↑ 9.0 9.1 9.2 Solivetti FM, et al. Role of contrast-enhanced ultrasound in early diagnosis of psoriatic arthritis. Dermatology 2010;220:25-31. ↑ Castelino M, Barton Anne. Genetic susceptibility factors for psoriatic arthritis. Curr Opin Rheumatol 2010;22:152-156. ↑ 11.0 11.1 11.2 Mease MD, Philip. 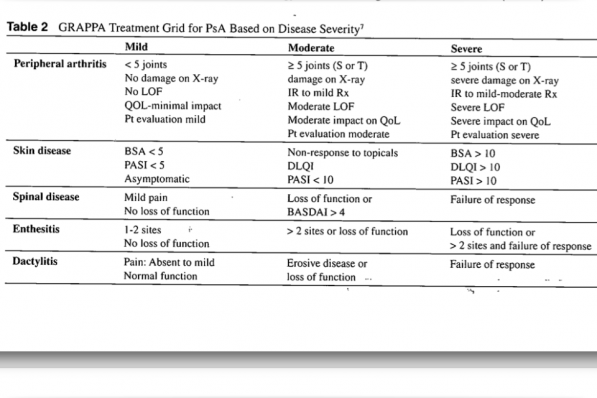 Update on Treatment of Psoriatic Arthritis. Bulletin of the NYU Hospital for Joint Diseases 2012; 70(3):167-71.http://eds.b.ebscohost.com/ehost/pdfviewer/pdfviewer?vid=4&sid=8ee565f0-094a-4aab-b969-cadd7ab01765%40sessionmgr113&hid=116 (accessed 20 MAR 2014). ↑ Menter A, et al. Guidelines of care for the management of psoriasis and psoriatic arthritis. Section 5. Guidelines of care for the treament of psoriasis with phototherapy and photochemotherapy. Journal of the American Academy of Dermatology. 2010;62(1):114-135. ↑ Lindqvist MH, Gard GE. Hydrotherapy treatment for patients with psoriatic arthritis-A qualitative study. Open Journal of Therapy and Rehab 2013;1:22-30. http://www.scirp.org/journal/PaperInformation.aspx?paperID=39916(accessed 20 Mar 2014). ↑ 14.0 14.1 14.2 Armstrong AW, Mease PJ. Managing Patients with Psoriatic Disease: The Diagnosis and Pharmacologic Treatment of Psoriatic Arthritis in Patients with Psoriasis. Drugs 2014;74:423-441. http://link.springer.com/article/10.1007/s40265-014-0191-y(accessed 20 Mar 2014).